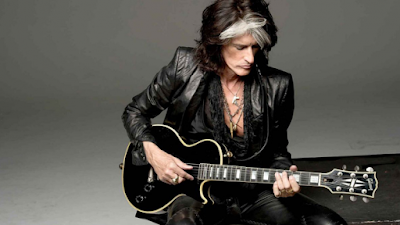 Aerosmith guitarist Joe Perry says he is busy in the studio working on a solo instrumental album. The guitarist’s latest solo project is the follow-up to his 2014 EP, “Joe Perry’s Merry Christmas”, which saw him joined by pal Johnny Depp on rhythm guitar. The Boston band recently released “Aerosmith Rocks Donington 2014”, which captures their headline performance on the final night of the Download Festival in Donington Park. Perry and Aerosmith frontman Steven Tyler are among the artists contributing songs for The SpongeBob Musical, which will open in Chicago next June. The project will feature tunes written by the Aerosmith duo as well as The Flaming Lips, Cyndi Lauper, John Legend, Lady Antebellum, Panic! At the Disco, Dirty Projectors, Plain White T's, They Might Be Giants and T.I., with an additional song by David Bowie. Been in the studio working on my solo instrumental CD I began when writing Rocks my autobio.but didn't have enough time.